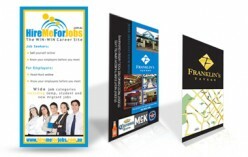 Sunshine Coast Printing is your one stop shop for all your printing needs. We have a dedicated and experienced team of award winning designers that can help create your brand, which will build loyalty and customer awareness. No matter what your budget, we have the ideal printing solution for your needs. Sunshine Coast Printing can look after small home businesses and larger companies. We understand what it takes to make the best impression. Our professional team can help you with all your printing, design and branding needs at a price you can afford. We can print and design simple “no frills” business cards or provide you with a Corporate Identity package, as well as other marketing and promotion material and merchandise. We can provide you with advice on the colour, finishes and latest printing techniques to add class. Sunshine Coast printing can also offer digital printing for your URGENT job with "24h dispatch". We can help increase your presence by designing and printing leaflets, flyers or even larger posters to allow you to build a presence in the marketplace. Print what you want, when you want at competitive rates. Dazzle at your next board meeting and impress your customers with our express presentation folders that will neatly and efficiently store your documents. 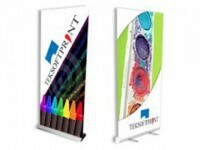 Printed on high quality PVC material these banner can with stand all weather conditions. They come with four eyelets and rope so can be easily hung. Printing full colour takeaway menus for low price and fast turnaround on 350 GSM with options for either matt or gloss laminate. Display flags, including pole kit and standard ground spike. If you are looking for cost-effective and economical DL cards you need to contact TEKSOFTPRINT, Western Australia. In addition to the existing shop in southern Perth, they have recently opened an additional shop at Midland to cater to the printing needs of people based in the northern suburbs of the city. The company prides itself in delivering services that are customer oriented and at low prices. Envelopes printed by Sunshine Coast Printing, QLD are customised to meet the needs of customers. We have compliment slips available to printed on 100 gsm stock. These lips can be used on both ink jet and laser printers to stream line your business invoices.